Safety site transformers are often used with industrial and power tools. They provide the user with protection by isolating the tools from the main power supply to prevent overloading and minimise shock risk. How do safety site transformers work? The transformer consists of two coils of wire around an iron core. The incoming, or primary, coil converts the electric field into a magnetic one, inducing an electric field in second coil without actually touching it. The voltage can be stepped up or down by varying the number of turns in the coil. 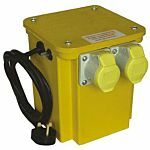 Safety site transformers can be used to step down UK mains voltage to, for example, 110V CTE (centre tap earthed) to limit the power of a potential electric shock. Safety site transformers can have different input and output voltage ratings. As they're often used outside, they're designed with the appropriate socket fittings. They tend to be heavy duty, with strong lifting handles, to withstand harsh industrial or site conditions. They can also be free standing and portable, wall mounted or even hung, depending on your needs.